Alabama has a need for qualified correctional officers at the local, state, and federal levels as the number of prisoners sentenced to more than a year in prison has increased year by year. 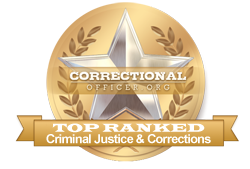 In the state of Alabama, correctional officers are employed by 15 major correctional facilities such as the Limestone Correctional Facility (capable of housing 2086 incarcerated persons) 13 community or work centers such as the Birmingham Community Based Facility, and 2 private facilities. Nationally, BLS reports that the corrections field is set to expand by approximately 22,000 jobs over the next ten years, indicating steady growth nationwide. Specifically, the state of Alabama employs 4,440 general correctional officers at the state level during the last data collection year and currently shows favourable month by month growth due to expansion, attrition, and professional advancement opportunities. Employees of the state earn an average salary of $42,776 per year. Read below for more information on the field of corrections in the state of Alabama. Miles College ranks 1st in our latest rankings with 34 students completing programs in law enforcement administration out of a total 374 students in the 2012-2013 school year. Faulkner University’s Criminal Justice/Legal Studies (CJ/LS) curriculum is designed to prepare the student planning to enter the field of criminal justice or legal studies by presenting a broad-based study of the many topics and principles essential to an understanding of the criminal justice and legal systems. The CJ/LS curriculum is also designed to prepare the student who is employed in one of the numerous criminal justice or legal organizations for promotion or career advancement. The curriculum seeks to encourage the integration of Christian ethical and moral perspectives with the more common value systems associated with the criminal justice/legal systems. Courses are available in the classroom at Faulkner University or online. Agency partnerships are available that will build more personal relationships with members of an agency while providing a discounted tuition while enrolled. Troy University ranks 3rd in our latest rankings with 547 students graduating from programs in law enforcement administration and criminal justice out of a total ten thousand students from the 2012-2013 school year. Alabama State University offers the Bachelor of Science degree in Criminal Justice which equips majors with a solid understanding of the institutions, processes, and current practices in the field. Our program encourages critical thinking and promotes the research, communication, and professional skills necessary to pursue opportunities in law enforcement, corrections, juvenile justice, government agencies, education, and business. If you are seeking a quality education in a caring environment look to the Hornet Nation! Auburn University at Montgomery ranks 5th in our latest rankings with 68 students graduating from programs in criminal justice out of a total a thousand students in the 2012-2013 school year. Northeast Alabama Community College ranks 6th in our latest rankings with sixty-eight students graduating from programs in criminal justice out of a total 1,772 graduates from the 2012-2013 school year. Judson College ranks seventh in our rankings with four students graduating from programs in criminal justice out of a total 130 students from the 2012-2013 school year. Chattahoochee Valley Community College ranks 8th in our latest rankings with 11 students graduating from programs in criminal justice out of a total 390 students in the 2012-2013 school year. University of North Alabama ranks 9th in our rankings with sixty-four students completing programs in law enforcement administration out of a total 2,736 students. Remington College-Mobile Campus ranks 10th in our rankings with seventeen students completing programs in law enforcement administration out of a total 750 students from the 2012-2013 school year. If former military, a discharge "Under Honorable Conditions"
Having met all the above qualifications, along with successful interviews proving to be of sound moral character, applicants will have a probationary hiring period as a Correctional Officer Trainee (COT). COTs will continue their specialized training for a period of 12 weeks at a state facility. Upon successful completion, he or she will be awarded the status of correctional officer and be assigned a duty location. One of the ways that the state of Alabama strives to serve and support correctional officers is through strong work conditions and competitive salaries. Currently, the median income for front-line correctional officers throughout the state is lower than that of the national median income, however, like all professions, investing in professional development will have salary returns. According to the occupational profile for the state of Alabama, http://www.careerinfonet.org/occ_rep.asp?next=occ_rep&Level=&optstatus=011000000&jobfam=33&id=1&nodeid=2&soccode=333012&menuMode=&stfips=01&x=53&y=12 published by CareerInfoNet.org, state and national trends predict a 4% and 5% increase in correctional officer jobs by 2022 respectively. For residents of Alabama, this rate translates into 180 job openings per year. The table below lists career information obtained from the BLS for correctional officers in Alabama. The table is sorted by total employment, with the largest metropolitan areas listed first.